- 1-Year hosting plan with free domain name. - with MySQL database support (for MotoCMS 3). E-commerce plugin enables featuring an online store, rich gallery of products and a storefront on your website. By installing this plugin into your site, you can quickly sell your products within a simple Checkout form. Features: mobile-friendly, info dashboard, product manager, SEO options, Media Library, product customization, product categories manager, special price option, discount system, brands and labels, flexible payment options. Customer and Order Management: personal customer account, adding clients via the admin panel, history of orders, multi-currency system, flexible tax settings, customizable payment methods, variety of rates. Installation: You have nothing to do with the installation process - no files to upload or setting to adjust. You purchase the plugin and it appears in your website template automatically shortly. If you want to launch your website as soon as possible, let us help! - Contact form activation with foolproof testing. Create a Contact Form with unlimited amount of fields, checkboxes, radio buttons and more. - Unlimited Fields. Add text fields, text areas, checkboxes, drop-down lists (sel ect box), radio buttons and Submit buttons with no limitations. - Automatic Notifications. Set notifications for users when the form submission is in progress, is successfully completed, can not be completed because of an error. - Validation Rules. Customize error texts, set max & min field length options. - ReCAPTCHA Field. Protect your site fr om spam and abuse by adding reCAPTCHA. Createso is a modern Moto CMS 3 template with a clean layout, simple and intuitive design and some very powerful features under the hood. 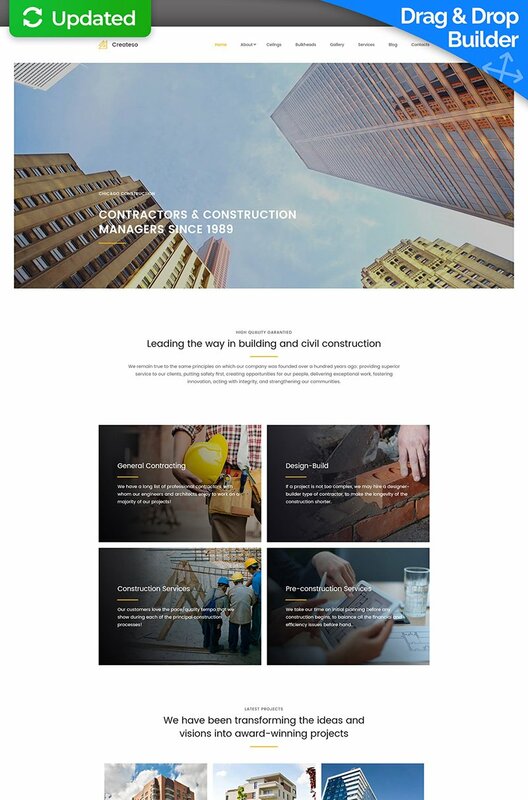 It is designed for construction companies in the first place, and that's why it is bundled with a set of pages built specifically for business websites. Photo galleries and video widgets will help you make your services more attractive for the customers. With an integrated drag & drop builder you will be able to create a unique looking website using tons numerous content blocks. No coding required! In addition, it comes with all the stock photos shown on the preview - for free.